The idea of a campus gym is almost as old as the University “We need a gymnasium,” moaned a student editorial in an 1886 issue of the Texas University Magazine. “We want no weak-eyed, stoop-shouldered youths to go forward as a result of University of Texas training. We want to send out no soured cynics, vilely compounded of dyspepsia, acetic acid and classic lore.” When the north wing of the old Main Building was completed in 1889, most of the basement was reserved for storage. Students and faculty alike thought the space might be put to better use. At their meeting in June 1896, the Board of Regents heard a proposal from law professor Robert Batts to convert the basement into a gymnasium. Given the University’s meager finances, the regents were unsure they could cover the cost of outfitting the basement with locker rooms, showers, and weight training equipment. They also wanted some assurance that if the money were found, the students would indeed utilize the room. In a bargain with the regents arranged by Batts, three students agreed to sign a guarantee for the estimated $500 cost of the weight training “gymnasium apparatus” on behalf of the student body, though whether they had the authority to do so was never actually determined. But the task of remodeling the basement itself remained an issue, as enough funds simply weren’t available. “The suspense was terrible,” recorded a witness at the meeting, “until a friend of the University volunteered to pay for these preparations.” The unnamed friend was George Brackenridge, a wealthy banker fromSan Antonio who had served on the Board of Regents since 1885. Brackenridge wanted to remain anonymous “because he prefers to give quietly and unostentatiously,” but his identity didn’t remain a secret for long. Brackenridge contributed $600 to the cause, and the renovation began almost immediately. The ground in the basement was excavated to deepen the floor and create an eleven-foot ceiling, and locker rooms with showers were installed at the north end. The students ordered exercise equipment from the Narragansett Machine Company in Providence, Rhode Island, one of the most popular suppliers of “gymnasium apparatus” in the country at the time. By November, the gymnasium was ready, and had cost almost $1500 to construct. Completing, and exceeding, their part of the bargain, the students were able to raise $900 to add to Brackenridge’s donation and finish the project. The gym was open to students who joined the newly formed Athletic Association, but as there was only one locker room, men and women were to use the facility at separate times. Part of the dues to the Association, along with a locker fee of one dollar per year, was set aside to pay for new equipment, general maintenance, and a gymnasium superintendent. Once the gym was opened, however, the regents’ fears were soon realized, as few students took advantage of the facility. The chief reason cited was the lack of a formal gym instructor. By February 1897, the treasury of the Athletic Association was empty, and the gym temporarily closed. The University took over the facility the next fall term, hired Homer Curtiss as the men’s instructor, reopened the gym, and required male freshmen to enroll in “physical culture” courses. Classes were held twice a week for an hour, either from11am to noon or from 3 to 4pm. Regulation gym clothes consisted of an orange and white striped sleeveless jersey, black tights or shorts, and “tennis slippers.” Sessions usually began with thirty minutes of pulley-weight work or “dumb-bell drill,” some practice on a gymnastics apparatus, a half mile run outside, and finished with a series of deep breathing exercises. 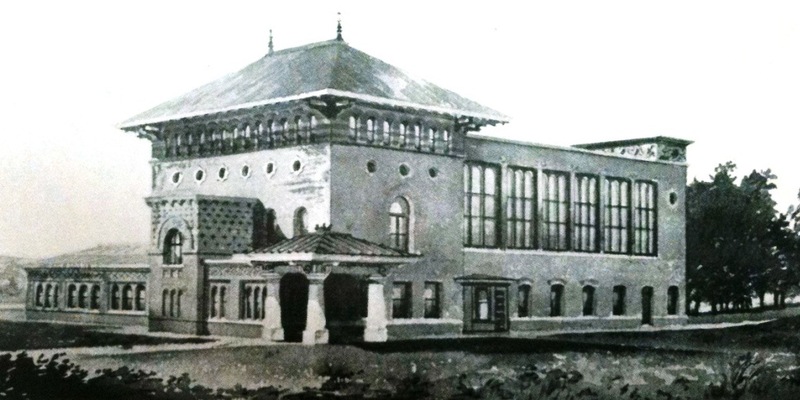 A separate gymnasium building was proposed in 1901 (pictured above). With an estimated cost of $25,000, it was to be placed at the southwest corner of 24th Street and Speedway, where the older part of Welch Hall stands today. It would have been just across the street from the University’s new athletic field, and was to contain a larger gym for basketball and seating for fans, an elevated running track, swimming pool, separate locker facilities for students in classes and UT athletic teams, and a trophy room. While there was interest in the new gym, the Board of Regents had to place academic needs ahead of athletics. An engineering building (built in 1904 and now called the Gebauer Building) and a new home for the law school (completed in 1908, but razed in the 1970s to build the Graduate School of Business building) were higher priorities. A full-fledged gymnasium had to wait almost three decades until Thomas Watt Gregory, an 1885 UT grad who had served as U.S. Attorney General under Woodrow Wilson, chaired a fundraising drive with the Texas Exes to construct the Texas Union, Hogg Auditorium, and Gregory and Anna Hiss gyms in the 1930s. This entry was posted in Uncategorized and tagged Gregory, gymnasium, Jim, Nicar, Texas, University by jimnicar. Bookmark the permalink. Great job! I look forward to reading more of these. Please keep them coming!